It's not a game! It's Real Life! Endorphin Games? What is it? A game, an adventure, a challenge, an experience and an escape from the daily routine in a parallel world of fun for you and your friends. Ideas, events and perceptions which surprise, shock, entertain, make you laugh and stay in your mind for a long time. In two words - Endorphin Games offers you emotions which release the hormones of happiness - endorphins. The Real Life Escape Game recreates the computer quest games of the type "Escape the Room" in a real environment. You find yourself in a specific strange space, which has been designed according to a unique story. Your objective is to complete your mission in time and to escape successfully. 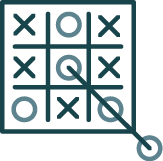 The game will challenge your observational and analytical skills, your logic, dexterity and team spirit. This is a live adventure. A movie, in which you are starring in the main roles. Every room has its own script and the events follow a story. The interior is more than a movie set because the players physically interact with the objects and the space. You'll find clues, you'll operate mechanical objects and electronics, and you'll use your spatial awareness. Every solved puzzle releases the mystery of the next one. In a world where the good and the bad are intertwined beyond recognition, to break bad sometimes seems to be the only way to win the game on the side of the good.